There’s a great deal that landed in our laps, Friends; and it’s a great opportunity to get your hands on essentials for a song. So I thought I’d better share it with you. I finally get to use my corny line: “Your loss is my grain!” *cheesy grin* Normally I’d just tell you what the deal is and go to it, but I’ve been mentioning this on Facebook to folks and I keep getting the same type of questions. So I’m going to go ahead and answer all of the questions that I’ve been getting first. O.K. Here’s the scoop. There was a “multi-level marketing company” that was all about selling #10 cans of “food storage.” Their distributors were promised lots of money and free food. The only problem is, they weren’t honest about the whole thing and instead of a multi-level marketing company they created a ponzi scheme which was quickly shut down by the SEC. This is actually good news for you—unless you happened to be one of the distributors who got sucked in to their devious plan. There’s one problem with all of this though; the manufacturer isn’t set up to reclaim 4 semi-truckload's of their product. I don’t care if they are Wal-mart with warehouses the size of Manhattan. 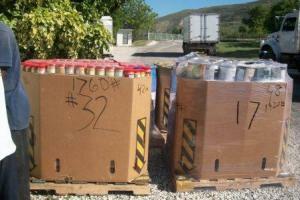 But the great news is that Five Star Preparedness has a great working relationship with the manufacturer. As a result Five Star was contacted by the manufacturer and given a great offer in exchange for Five Star Preparedness moving the product. Five Star gets to pass it on to you guys and help you get a hold of some key essentials for your pantry that are packed in #10 cans and ready for stable shelf-storage! I’ve asked ALL of the possible questions that I could on these products and also tried a couple of the ones that merited as such. So I’m going to give you the entire lowdown on them. Ready? Here ya go! First here are the packages which Five Star has grouped the items. After that you can check out the specifics on the items IN the packages for detailed info such as GMO, irradiation, uses, weights, ingredients where applicable, shelf-life, etc. If you live where you can pick these up instead of having them shipped to you, please do so NOW as Five Star keeps getting huge orders in from single individuals. For those of you who would need your order shipped I did some searching to make sure that the overall cost was still a good deal. The thing that I’ve learned a long time ago is that you’re paying for shipping one way or the other—either it’s built into the price of the product or you’re paying the actual shipping charges. Either way, there’s no such thing as “free shipping”. So I checked Honeyville Farms since they advertise shipping of $4.49 per order. A #10 can of pinto beans is $13.89. 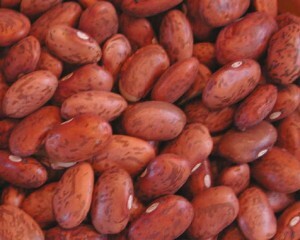 The cans of pinto beans break down to $8 each. You can get a case of the beans at Honeyville for a little less per can than the $13.89, but it’s still higher cost per can. I found the same for yellow popcorn (which I LOVE to store instead of corn meal because then I get popcorn AND fresh corn meal). The powdered milk I was finding for $22 a can plus $10 shipping per case. So I believe that overall if you can take advantage of this you’re still getting a great deal. But those of you who don’t have to pay for shipping are getting a FANTASTIC deal! 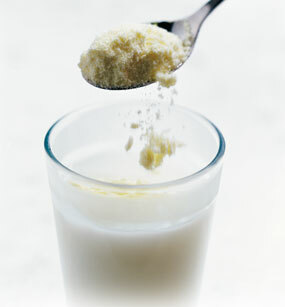 Just so you know, I’m not a fan of the powdered milk for straight drinking. I do have a picky palate when it comes to that, but it is fine for baking as I used it last weekend. How do I order my essentials? Finite details on the products are listed below for your perusal. Have fun stormin’ the castle! 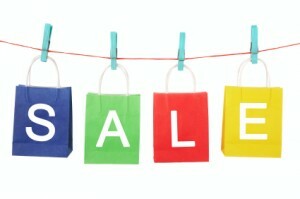 Go to Five Star Preparedness to place your order. You do NOT have to pay through Google Checkout. You can send them a check or money order instead, should you so desire. Hard Red Wheat: 5 Pounds, #10 can, 20+ years shelf-life when stored under ideal conditions. GMO and irradiation free and triple-cleaned; ideal percentages of moisture and protein, direct from the fruited plains of the U.S.A. Hearty texture is great for fuller, more satisfying bread, hot and cold cereals, as a substitute for rice, and as a preferred source for delicious, nutrient-dense sprouts in as little as 3 days. 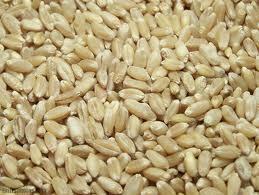 Hard White Wheat: 5 pounds, #10 can, 20+ years shelf-life when stored under ideal conditions. GMO and irradiation free direct from the wheat plains of the U.S.A; ideal percentage of moisture and protein to create perfect pastries, breads, cakes, cookies, and muffins; a great substitute for a creamy rice pudding and a fine source for fresh nutrients when sprouted too! Long Grain White Rice: 5 pounds, fully protected in #10 can, 30+ years shelf-life when stored in ideal conditions. Polished grain is suitable for traditional rice dishes including stir fry dishes and rice pudding; and can also be used as a gluten-free flour. 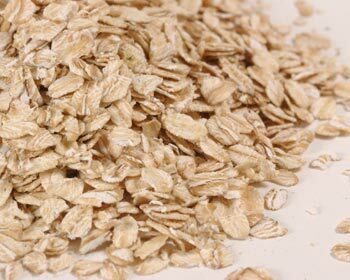 Rolled Oats: 2.2 pounds, fully protected in #10 can, 20 year shelf-life when stored in ideal conditions, harvested in the U.S.A free of GMO with the ideal percentages of moisture and protein. Also serves as a great gluten-free resource as a cereal, ground into a flour, or served whole in some homemade granola. All-Purpose Wheat Flour: 3.85 pounds, #10 can with a 15+ year shelf-life when stored in ideal environmental conditions. This is hotel/restaurant quality of all-purpose flour that consists of wheat flour, reduced iron, thiamine mononitrate, Riboflavin, enzymes for better yeast baking results, folic acid, and is GMO free. It’s also important to have regular flour on hand in order to gradually work your way towards eating 100% wheat at some point. Pinto Beans: 4.7 pounds, tripled-clean and protected soundly in #10 can with a 25 year shelf-life when stored in ideal cool and dry conditions. A protein packed source of food containing Vitamins A, B, C, and E as well as key minerals such as calcium, magnesium, niacin, phosphorus, potassium, and amino acids which can be increased 400-500% when sprouted. A universal taste for a myriad of traditional recipes as well as some non-traditional ones when ground into a flour or pureed into a paste. Yellow Popcorn: 4.2 pounds, suitably protected against critter and moisture invasions in #10 can. This is a better way to ensure you always have corn meal on hand as you can either enjoy this as a healthy, GMO-free snack or grind it into fresh and tasty cornmeal perfect for tortillas, muffins, and other indulgences while enjoying low calories, zero cholesterol, and good fiber. You can also run it through stone-based grinders to clean the stones. Certified Kosher with an expected shelf-life of 20 years if stored in ideal low moisture, cool conditions. Yellow Dent Corn (Maize): 4.73 pounds of triple-cleaned, dehydrated corn packed in #10 can for protection. Certified clean of e-coli, salmonella, Staph aureus, and Aflatoxin. This is also certified as a sterile hybrid which is resistant to genetically modified dent corn pollen. 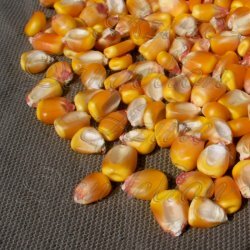 Enjoy this food-grade corn as a great source for its fine flour which is easy to incorporate into some of your favorite dishes such as corn cakes, cornmeal mush, light muffins, tortillas and tamales, and is also great for gluten-free diets. 20 year shelf-life when stored in cool, low moisture conditions. Mountain Mill Instant Powdered Milk (Milk Substitute/Alternative): 3.5 pounds in each #10 can which yields 24 quarts of this great whey-based milk substitute that’s ideal for your cooking or baking needs without compromising any of the nutritional needs of regular milk. This great product includes fat solids which are necessary for proper bone growth for children—making it great--even as a beverage, for you and the kids; 10-15+ years shelf-life. I would love to pick up some of the product mentioned above, but where would I go? I have no idea where the product is located. Please respond to my e-mail. Thank you. Costco has a pretty good sale running till May 20, and from what my wife and I see they are offering better pricing, but it is more bulk. Trying to make the right decision, would love someone's opinion if they have been down this road and have some experience. You will definitely find better "by the pound" pricing at Costco and Sam's Club even without the sale. The asset to this sale IS the #10 cans. That you won't find priced like this. Everything else you've got to use and rotate. Thank you for the info Kellene. I was glad to see a gluten free option . That is a great bonus to our family! What is considered "ideal" for storing the cans? If I don't have ideal circumstances, what kind of shelf life would I likely get? Thanks, I really appreciate it. Ideal storing conditions are always "cool, dry, no light." How much your shelf-life gets reduced depends on how many of these conditions are violation and by how much. Wheat, whole corn, yellow popcorn, and pinto beans would be pretty tolerant of some rougher conditions, and items in #10 cans make them that much more tolerant. Thanks for helping clarify. I've really enjoyed all your tips and blog posts since first seeing you on Doomsday Preppers. I had to look up "the egg lady" and how to preserve a good deal on eggs. Gotta love savings! Even with shipping this is a good buy (I think:) Just need to know which ones to order.... Thanks! Sometimes it helps to use quotation marks in the search options. This is what I found for you real quick. I'd contact them directly. Sorry. I only have info on what I researched and the data I was given. Okay thanks Kellene! Yep, I found it ! Are the seeds all mixed together in each # 10 can ? figured that was the reason for the "hole in the top" suggestion or like 1 can has all the same per can? They are packaged individually (by veggie) in the can. The reason for the "hole on the top" is because seeds have got to breathe. They are alive--at least you want them to be.) I don't know bunches and bunches about it though...sorry. That was given to me at the last moment and since there were only 54 I wanted to make mention of it to you guys first. I have a bad habit of giving the Facebook wall all of the info. We got our order yesterday, we were like kids in a candy store. Thank Kellene for setting me straight on the shipping. Our shipping was $266 for the I want it all. That being said it averaged out to be abouit $11.00/can, WOW WHAT A DEAL. We are going to order more. This is what you call comfort food, it made us feel so good to be stocking up. Thanks to Kelleene and 5star!!! what about food for the gluten intolerant? what and where should I go? They have a gluten-free package. In addition to that I'd suggest spelt, quinoa, millet, amaranth, etc. Sprouting your grains of this nature are really good for you too! I wanted to check the cost of shipping compared to other suppliers, and thought wow it was pricey. The company representative was kind enough to explain milk weighed more than most people would think. So I did price and weight comparisons with other companies and found 5 Star Prepardness special was the best product for the money. This company deserves a nice review, their customer service was wonderful. I am ordering more of their products before they sell out. Hi...I am new to this and keep hearing "you cannot store ground flour for more than a couple of years and that you need to buy the berry to store long term." Do you know why? I have baked cake and muffin mixes that have been on my shelf 4-5 yrs and they turn out tasting fine though sometimes the levening is not what it should be. Then I came across 5 Star Preparedness' website with Shirley J brand baking mixes, like whole wheat bread, brownies, biscuts, pancakes, muffins etc and the shelf life is 25-30 yrs in 4 lb mylar bags, not even in sealed cans! What is the deal? I am very confused! it's the vitamin E in the wheat grains that protect it from going bad and keeping it alive. However, once you crack the grain and expose the Vitamin E oil to oxygen it begins deteriorating and goes rancid. The packaging that Shirley J uses for their bags has been tested and certified by a local university for 25-30 years. Thank you so much for clearing that up! I bet lots of folks wonder about that! I saw you on Nat Geo, and have become a prepper because of you and others on that show. What an eye opener! Thank you so much for exposing yourself to that show and You Tube and your website here! I have learned alot and appreciate it so very much! My two favorites are the new milk from Thrive Life and the Augason Farms milk branded Country Fresh.